Todd and Barb’s Rapids Resort is conveniently located right next door the Kosir’s Rapid Rafts. 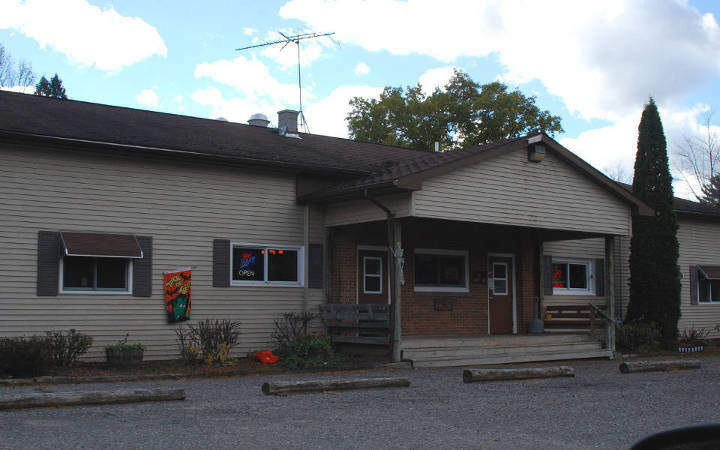 Todd and Barb’s Rapids Resort offers a full service bar and restaurant with daily lunch and dinner, weekend breakfast, home made pizza and other Italian specialties. The dining room provides a nice view of the river. The bar and game room offer a juke box, pool table and video games. Campers can purchase ice and packaged goods to go if desired. Todd and Barb’s Rapids Resort also offers overnight accommodations in their four rustic, riverside cabins. Available seasonally from late April through Deer Gun Season in November, these cabins are fully updated with all the modern conveniences including heat and electric, and hot and cold running water. Cabins have a screen porch overlooking the river, and yard space with picnic table, grill and fire pit. The cabins are within a few short steps of the bar and restaurant, and Kosir’s Rapid Rafts. Visit their website to see all that Todd and Barb’s Rapids Resort has to offer, and we hope to see you soon at Kosir’s Rapid Rafts and the Todd and Barb’s Rapids Resort in Silver Cliff, WI.